The Minnesota Rennaissance Festival is a month-long fair recreating life in 16th-century Europe. Held on a 22-acre (89,000 sq metre) field in Jonathan, Minnesota every autumn, the festival offers food, shopping, and entertainment all designed to be as authentic as possible to the era. 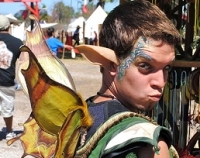 Visitors can sample foods like turkey legs and apple tarts or the favourite Barbarian Burger while they take in a round of jousting or catch medieval comedy with performers like Zilch the Torysteller or popular comedians Puke and Snot. Pay a visit the royal court, and you might even catch a real medieval wedding! Fair-goers are encouraged to come in costume, but if you don't have your own you can find whatever you need in the fair's shops.